Amazon India has decided to go for the fastest growing ecommerce segment right now: Fashion. They have just launched their exclusive mini portal for offering apparels and accessories for both men and women. They have announced this launch via full page advertisements in major newspapers all over the country, making their intentions pretty clear: They want to dominate this market. 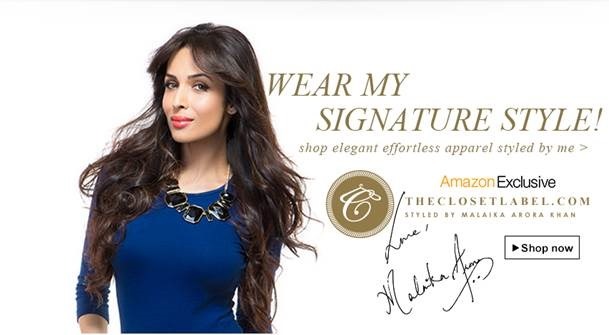 Last month, they had entered into an exclusive partnership with The Label Corp, which has enabled them to source styling tips and suggestions directly from style divas Malaika Arora Khan and Bipasha Basu. And they are using this partnership to it’s fullest extent right now. Earlier this year in the month of April, Amazon had signaled their entry into the apparels niche with the launch of ‘The Ethnic Store’, which provided traditional wears and some selected indo-western wears. 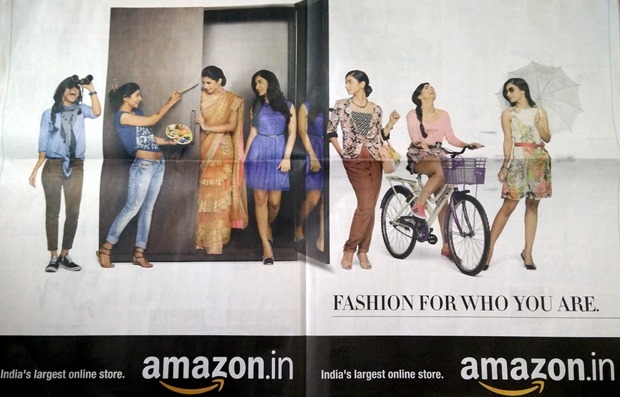 But with this full-fledged launch of Fashion section, Amazon has made it clear that they will not settle for less. Online fashion and apparels niche is growing at a break neck speed right now. Last year, Rs 3354 crore ($559 million) worth of apparels and fashion accessories were sold online, which will swell to Rs 16,800 crore ($2.8 billion) by 2016. Traditionally, electronics and mobile have been the biggest market but it seems fashion and apparel will certainly overtake them sooner than we expect. Overall, women in India are expected to spend $3 billion shopping online in the next 3 years, and 90% of the shopping done by women are related with fashion and trends. The biggest growth rate for online fashion is coming from Tier 2 and Tier 3 cities, as offline retail brands are not available there, and women from these cities rely on ecommerce portals to satisfy their fashion needs. In the month of May this year, when Flipkart acquired Myntra for $250-300 million, it had created ripples across the industry. This acquisition made Jabong as the biggest competitor for Flipkart in this niche. Ecommerce insiders are now asking, what can be the next logical step for Amazon to capture maximum market in shortest possible time? We had earlier reported that strong rumors are abuzz regarding possible Amazon-Jabong acquisition and now, it seems more possible than ever. In case this deal is materialized, it would be direct fight between Flipkart and Amazon for the #1 position in fashion, apparels and accessory niche. Indian fashion market (apparels, accessories and footwear) is pegged at Rs 2,58,000 crore ($43 billion), and online shopping of apparels constitute just 1% of this market. Both Amazon and Flipkart are aware of this fact; and the next battle for supremacy can change the equations of this industry for ever. Amazon Offering $220 Worth of Premium Android Apps Free. Only Today!